Mark and Amy Meyers bought their first donkey, Izzy, as a companion for their horse. They were blown away by his loving personality and soon began rescuing abused and neglected donkeys in the community. In fact, thanks to Izzy’s charm the couple went on to establish Peaceful Valley Donkey Rescue in 2000. To date, the Texas sanctuary has rescued more than 8,000 donkeys and burros. While wild burros are equally protected under the Wild Free-Roaming Horses & Burros Act of 1971, the mustangs often seem to receive most of the public’s attention. As of March 2017 the Bureau of Land Management’s (BLM) estimates that there are 13,191 on-range burros on federal lands spread across 10 states. According to the HSUS some of these burros are descendants of donkeys brought to the Americas as work animals who either escaped or were released into the wild. As the burro populations grew, they clashed with ranchers because they were competing with livestock for grazing lands. In some cases, burros have been shot when they were considered bothersome. To help control the numbers in the wild, the BLM conducts annual roundups of wild burros transporting them to government holding facilities where they’re available for adoption. Meyers’ sanctuary rescued its first 500 burros in 2004 after an amendment to the 1971 act stated that animals who were more than 10 years of age or had failed adoption three times could be sold — usually for slaughter. 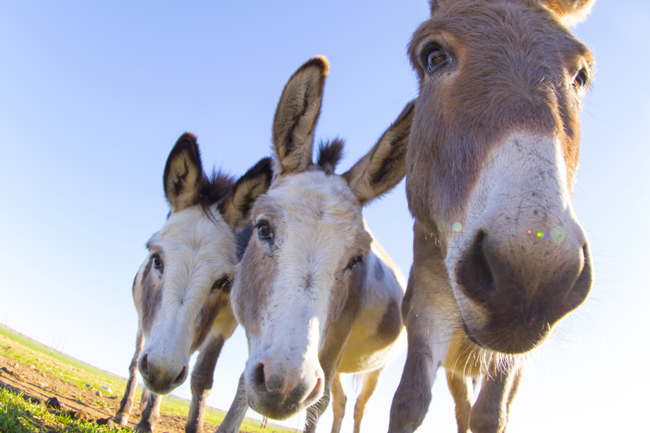 According to Meyers and other animal rights activists, more donkeys and burros are being sold for slaughter in the U.S. to supply the global market. Donkey sanctuaries worldwide are concerned about the growing demand for donkey skins in China where they are being used to make gelatin for a product called ejiao. Meyers said when the sanctuary polled members of the local community on what characteristics they would use to describe donkeys the three words most frequently used were “stupid,” “stubborn,” and “dangerous.” None of the responders had actually ever met a donkey. In 2015, the sanctuary produced “Forgotten: The Plight of the American Donkey,” a mini-documentary addressing the challenges faced by donkeys and burros including how they are so misunderstood by the public. 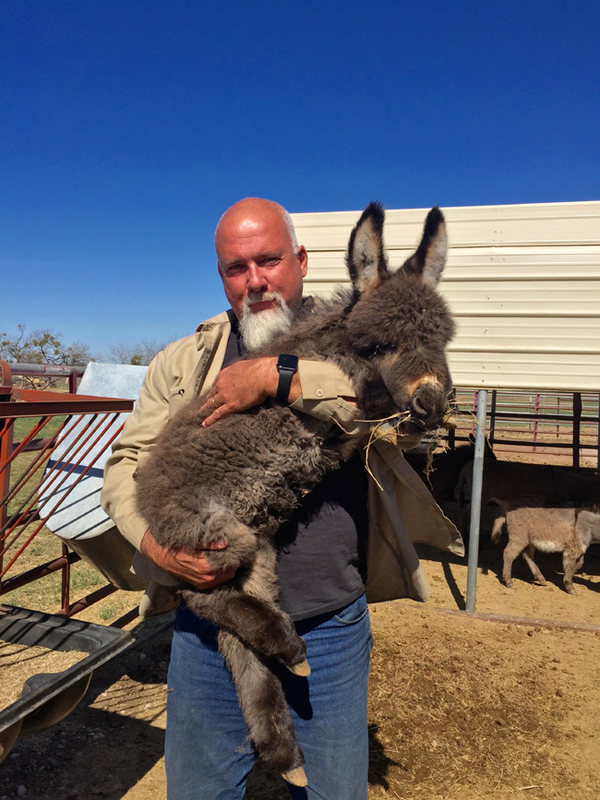 Mark Meyers with baby Joey at Peaceful Valley Donkey Rescue in Texas. What are Burros and Donkeys Really Like? Intelligent, cautious, playful and extremely loyal are the characteristics Meyers uses to describe the animals he has devoted his life to saving and protecting. When it comes to working with burros, April Lee, equine trainer and founder of Family Horses, a nonprofit that works to help wild mustangs and burros find adoptive homes, said once burros get over the initial hurdle of trusting people, they learn much faster and retain lessons better than horses. How Long Does it Take Burros to Adapt to Their Adoptive Families? Some will adapt very quickly said Lee who has placed more than 400 burros into loving homes. A lot depends on how often the family interacts with the burro and the types of activities they engage in. Burros who go to homes with lots of other hooved companions are more inclined to bond with the other animals. What Activities Do People Typically Do With Their Pet Burros? While many adopters keep their burros strictly as pasture pets, others involve them in activities. For example taking them along on hikes, training them to pull carts or riding them. Burros are also adopted out to serve as “guard donkeys” protecting sheep, alpacas, goats and other farm animals against predators. Lee is especially excited about the placement of two gelding burros who won her heart and are now serving as ambassadors for wild burros. One lives in a rescue facility where he babysits orphan foals and participates in children’s camps. The other went to a home where he greets thousands of monthly visitors who otherwise might never have met a burro. 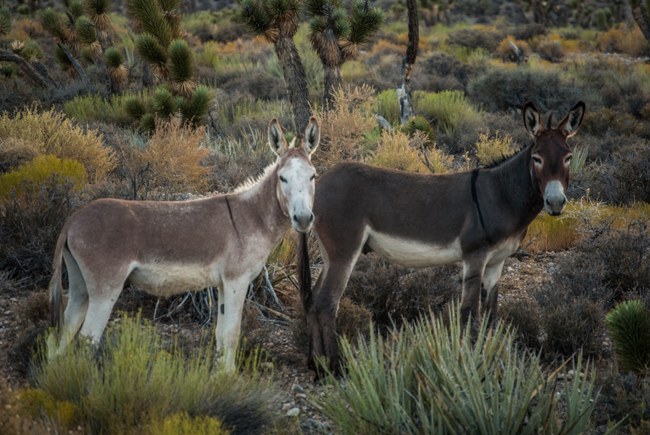 The BLM has a list of requirements that must be met before applying to adopt a wild burro. These tend to be typical of adoption policies at individual rescue facilities. If you are looking for a pet, be ready to spend at least a month with your new burro in a corral so that he can get used to you and your family. You can’t turn a recently-gentled burro out into a pasture as soon as you get home and expect her to want to come and hang out with you. That type of relationship requires work and time. Consider that burros have a longer lifespan than horses and make sure you have a responsible home as a backup in the event your life circumstances change. Peaceful Valley Donkey Rescue retains the title for the life of their burros and will take them back if an adopter can no longer care for the animals.